The wildlife of Florida is rich and varied, yet most of us are familiar with only a dozen or so species: the "flagship" endangered species such as manatees and panthers; those, like raccoons and squirrels, that have adapted to urban environments; the frightening alligators and black bears; and those like the armadillo who can't seem to cross the road. Yet they are just a few of the many animal species found in Florida. Florida once claimed more than 80 land mammals. The white-tailed deer, wild hog, and gray fox can still be found in the wild; such small mammals as the raccoon, eastern gray and fox squirrels, and cottontail and swamp rabbits remain common. 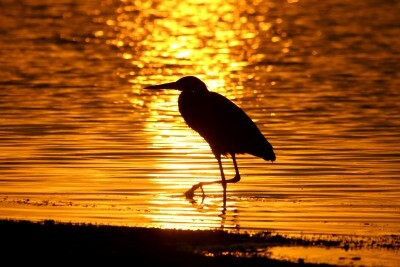 Florida's bird population includes many resident and migratory species. The mockingbird was named the state bird in 1927. Common Florida reptiles are the diamondback rattler and various water snakes. Turtle species include mud, green, and loggerhead, and various lizards abound. More than 300 native butterflies have been identified. Florida is both a sub-tropical and tropical area and as such has a variety of species that can be found in different areas of the state. The long coastline on both the Atlantic Ocean and the Gulf of Mexico also provide an unique environment for different Fauna. Detailed information and photos of each unique animal type can be found under the following categories: Reptiles & Amphibians, Florida Fish, Florida Insects and Spiders, Florida Birds, and Florida Mammals. All of Florida's lands have been declared sanctuaries for the bald eagle, of which Florida has about 350 pair (2nd only to Alaska among the 50 states). 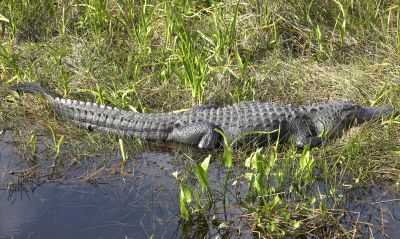 The state's unusually long list of threatened and endangered wildlife (57 species) as of August 2003 included the American crocodile, shortnose sturgeon, six species of sea turtle, red-cockaded woodpecker, Florida panther, key deer, West Indian (Florida) manatee, six species of mouse, Key Largo woodrat, Everglade snail kite, two species of sparrow, Atlantic salt marsh snake, eastern indigo snake, Okaloosa darter, Stock Island tree snail, and Schaus swallowtail butterfly. The Everglades provides a sanctuary, as well as a breeding and feeding ground, for many species of wading birds that depend on the climate's wet and dry cycle in order to reproduce. The great egret, snowy egret and roseate spoonbill live relatively undisturbed in the Ever-glades with other rare and unique birds. The anhinga, sometimes called the "snakebird" because it swims through the water with only its thin neck showing, also lives here. Another resident, the endangered wood stork, is the only stork native to North America. The threatened bald eagle and the few hundred remaining endangered snail kites are also at home in the Everglades. From the southern end of the park, along the shoreline of Florida Bay, the tangled, dense mangrove forests wind their way up the western side to the 10,000 islands in a swampy maze that is part land and part water. It is here that the freshwater of Okeechobee mingles with the ocean's salt water, creating a brackish, nurturing environment. Water birds, sea turtles, fish, alligators, manatees and crocodiles find shelter and abundant food here. With more than 20,000 lakes and ponds, 21,000 miles of streams and rivers and 8,426 miles of tidal shoreline, Florida has no shortage of fish. From freshwater to saltwater, there is an abundance of fish, water mammals, and mollusks found in all areas of the state of Florida. More people travel to Florida to see wildlife than any other state, and Florida is second in the nation in the total number of wildlife watchers. In 2006, wildlife viewing activities generated more than 3 billion dollars in Florida! Florida's wildlife and human population are encountering each other more often than ever before. As humans develop more open space and wildlife habitat is reduced and fragmented, encounters between humans and wildlife become more common. For most people, observing wildlife is a thrilling experience, but when an animal causes damage or attempts to share your living space, that thrill can turn to irritation or fear. From fall through spring Florida not only enjoys its best weather, this period also furnishes the year’s prime birding and wildlife viewing opportunities. Virtually every region in the state celebrates the outdoors with its own birding, wildlife or nature festival designed to highlight nature’s best in their area. Most are family-type weekend events that are kid-friendly so no one is left out.